Decorating a new home for the holiday can be so much fun, just hanging a few ornaments here and there and a garland over the door can make such a difference. 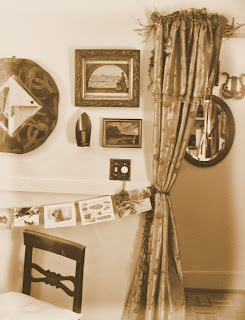 A ribbon across the kitchen wall holds cards received, fun to add more as they come in. No tree this year but I'm surrounding myself with friends' artwork and photography, the surest way to make a house a home. In the center of this photo, an image from my friend Chris Kowalski, who sadly left us this year but will forever be remembered.